The previous MMM car – a 2004 Subaru Impreza wagon. Those stock roof rails allowed either bikes or large pieces of lumber to be carried easily on the roof. So you’ve got a small car now. It’s a hatchback or wagon design, which allows you to carry bulky stuff as well as people. Thanks to that nice open interior space, you find you can easily carry 8-foot 2x4s home from the building materials store, as well as dressers and small appliances. Good for you! But thanks to Mr. Money Mustache and other positive influences, you’re getting more into home renovations and maintaining your own stuff these days. And unfortunately that means carrying much bigger things home. 4×8 sheets of plywood and drywall. Windows and doors. Long pieces of baseboard and trim. Even the occasional ladder, canoe and kayak. Long ago, we covered some ideas on turning a little car into a big one. One of the tips was the idea of using a roof rack and optionally a roof box to expand your cargo area. 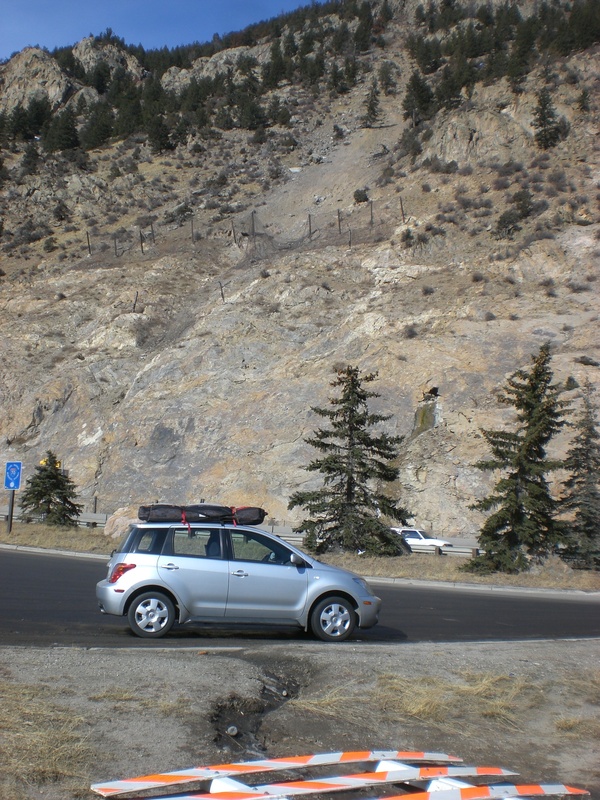 But the problem with commercial roof racks (Yakima, Thule, etc.) is that they are designed for sports equipment and not building materials. Thus, they are typically very short. To carry long items without having the wind whip them around, you need a longer rack. From about 2006-2011, I had the pleasure of hosting a golden old work truck that a friend lent me because he didn’t have space to store it. 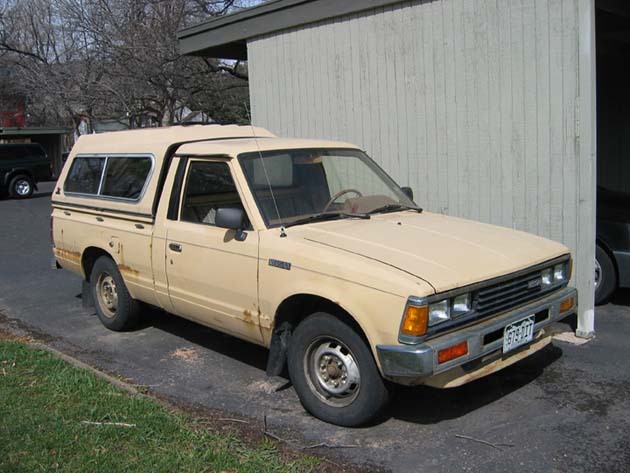 It was a 1984 Nissan compact pickup, rusty yellowish-brown in color, and it went by the name “El Amarillo”. Although it had only a 6-foot cargo bed and about 50 horsepower of output from its old rattly engine, boy could that old truck do some work (and it still can to this day!) But in my house-building work I often had the need to carry 16-foot pieces of lumber and even 24-foot sticks of steel for welding projects. Neither are practical with any size of pickup truck without modifications. Here’s the Amarillo in 2005 BEFORE I welded on a roof rack and used it for five years. (It still looks just as good and runs like a champ today). To solve this need, I built a 12-foot long roof rack for the Amarillo out of steel. It hung out a couple feet over the back of the truck, and extended all to the windshield at the front end. With a 12-foot rack, you can carry 24-foot material with a tolerable 6-foot overhang at each end, making it stable enough for a careful trip home from the metal store. And of course, carrying 16-footers and 4x8s with this rack was effortless. 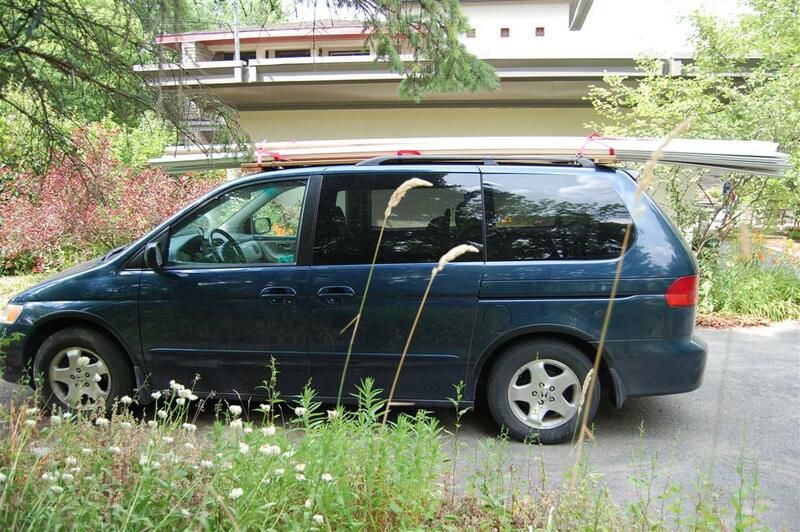 In 2011 however, I returned the Amarillo and bought my current work van, a 1999 Honda Odyssey minivan. In most departments, it is a big upgrade: the three rear doors allow much more efficient loading, and the 160+ cubic foot cargo bay can hold some massive stuff (50 sheets of plywood fit easily, for example). And it locks up and keeps everything safe from rain and dirt. But I still haven’t gotten around to making a real lumber rack for the new van. The Amarillo was old enough that my friend didn’t mind me welding things right to the body. With the van, I will need to put a bit more finesse into it. But that doesn’t mean I can’t carry big materials yet. This van, just like many smaller wagons and hatchbacks, came with roof rails. These are usually hollow aluminum tubes that are formed to the shape of the car and attached at several points. They are not much use by themselves, but they provide a base to which you can attach commercially-made crossbars, which can then hold accessories for skis, small kayaks, or mountain bikes. But those crossbars still don’t help us carry big lumber. Luckily, there is an extremely easy way to convert a roof rail system to a big rack system. And without the sometimes-major expense of a commercial roof rack. 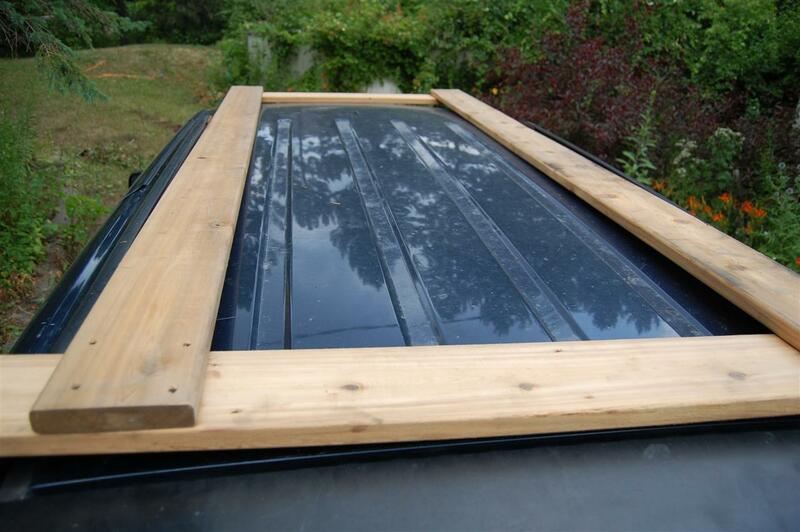 You just need to custom-fit your own rectangle of sturdy wood and strap it tightly to the existing roof rails. If you look closely, you can see that I just had to snug a pair of 1″x5″ boards (2x4s work too) to the inside of the existing roof rails, then screw cross-pieces to each end of the rails to create a rigid square. Then, you can just use straps or bungees to attach the rack to the car/van, and leave those attached as long as you need the rack in place. 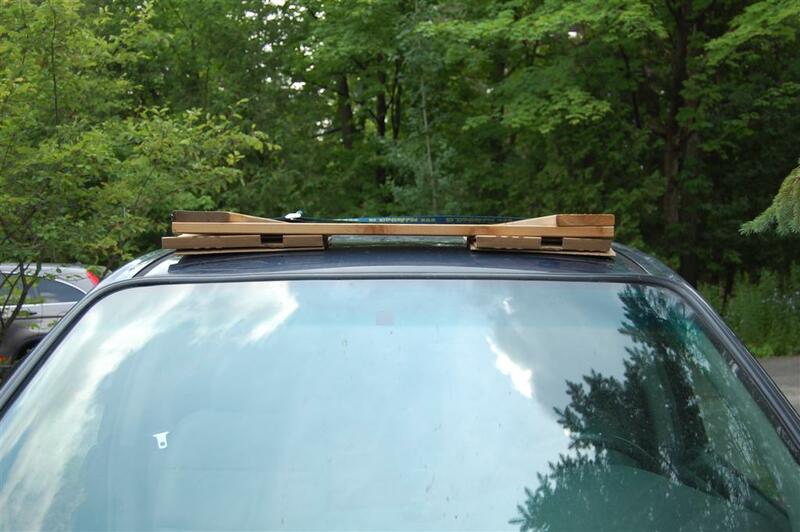 Strength is no problem with a rack like this – through the natural flex of the wood, it automatically distributes the weight right along the interior frame of the car’s roof, which is located at the outside corners right under the stock roof rails. I have carried up to 500 pounds on racks of this style without adverse effects (although the car’s cornering is affected by a top-heavy load, so take it slow). If you care about the paint job on your roof (on my construction van, I generally do not), you can wedge bits of cardboard or carpet under the wood frame, or even attach permanent pads to the wood with hot glue before setting the rack in place. Here’s a front view of the rack, strapped on with a ratcheting strap, and padded at the front by cardboard. Side view – a huge bundle of 14 foot baseboards, easily secured to factory roof rails with no rack. Since I needed this load to survive speeds of up to 65MPH, I deliberately biased the loading towards the rear. When you’re driving at highway speed, there is a huge wall of air rushing upwards over the windshield. If you leave long floppy pieces of wood in this wind river, they will get pulled upwards and possibly even broken. Tailing from the rear, on the other hand, the lumber gets a smoother ride in the slipstream. Tech Tip: The absolute key to safe carrying of lumber and other big stuff is ratcheting straps. They look like this and you should be able to find a 4-pack of them at Home Depot/Lowe’s (Husky brand or similar) for $15-$20. You don’t want to mess around with rope, string, tape, or even bungee cords except on the slowest and shortest of trips. This type of strap allows you to make a much tighter connection than even the strongest sailor could do with fancy knots and a rope. The trip was a success, and I even saved the rack in a safe place so it will be waiting for me when I continue working on this cottage next summer. More importantly, I hope this plants an idea in your own head about ways to carry cargo without resorting to a pickup truck. When you buy a small hatchback or wagon for your next car, look for the presence of roof rails as an important added bonus. Previous Post: Is it Convenient? Would I Enjoy it? Wrong Question. Next Post: Weekend Edition: Where do we Go Now? Cool. I’d love to see some close up pix of how you tie things down–rack to the car and lumber to the rack. I live in fear of things coming loose and blowing off into the car behind me. You can click on the pics above to get slightly bigger versions. In general, just go for the concept of “Squeeze everything together, while simultaneously squishing it down to the homemade rack to create friction”. So, loop under the rack and over the material, then squeeze. At least one loop at the front and one at the back. I have those stupid roof rails that don’t have any through-holes, i.e. they’re just long metal grooves with the opening to the inside. Any suggestions? It’s not ideal, but you could do the same setup as MMM, and use the ratcheting straps through the interior of your car via open doors or windows of your car. Those straps are thin enough that the door should close without a problem. Alternatively, you could try to wedge the pieces parallel to the windshield into the opening in the rack, and possibly attach metal screws through the rack into the wood. I’d imagine this is a bit more risky. +1 for the trucker’s hitch. I haven’t used a ratchet strap since I learned this knot. While I haven’t used it to secure long boards to a roof I have used it for many other hauling situations at high speed to great success. And all you need is cordage and a little know how. But heed MMM’s warning as he has more experience than I at hauling building materials on a roof. +1 for the truckies hitch, had my father drum this knot into my head for tying down loads, also drive a little then recheck your load is secured as it my have settled some whilst under way. the trucker’s knot IS a low tech version of a ratchet strap. Or, rather, it’s a 3:1 pulley system like a simple mainsheet block on a small sailboat. Just without the pulleys:) It will definitely work but also wear out eventually. And a nice rope costs just as much or more than nylon ratchet straps which are just less of a hassle in the long run. 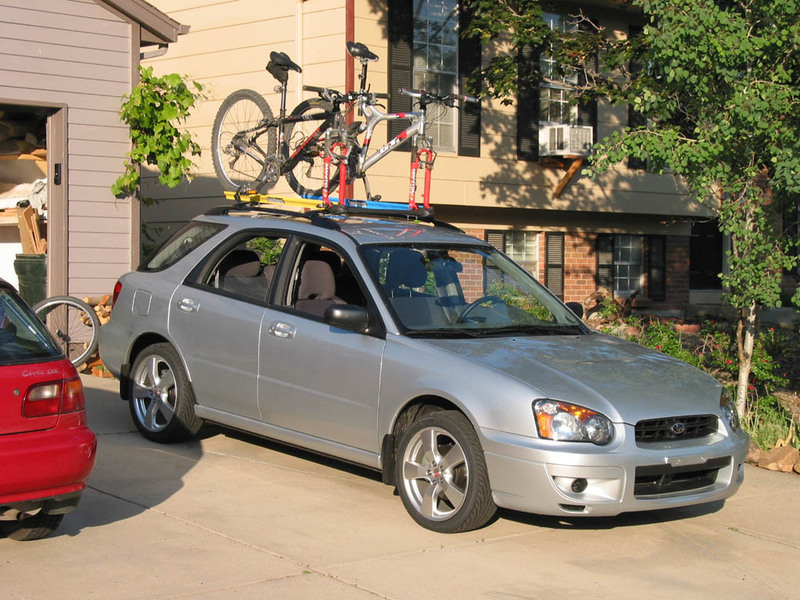 A roof rack may be a bonus, but leaving it on when you’re not actually using it will increase aerodynamic drag, which means you’ll burn more gas at highway speeds. So give a little thought to making it easy to remove & install. Yup. The commercial rack I use to carry bikes and kayaks on my car goes on and comes off in a few minutes. If I leave it on, I notice a 1-3 MPG hit to the economy. One other thing for those carrying lots of sticks of skinny material. Have some cord to tie together or wrap the sticks in the front (and the back, if you have enough). That way they mutually support each other and won’t flop around nearly as much as they would other wise. I definitely agree – on all my cars through history, racks ONLY go on for the bike trip/ski trip/lumber store trip/whatever. Once you’re in the habit of taking them off, you can do it very quickly and the gas savings are very worthwhile. This is awesome! I need to mount something like this on my Prius so that we can not be so tight during cross country drives. For cross-country drives, you’re probably better off with a light trailer. (Assuming you’re not hauling long, skinny stuff.) It’s aerodynamics again: anything on the roof is going to increase drag significantly. A well designed trailer will sit in your car’s wake, and not cause much drag. Indeed, the right shape might even decrease the drag. Way to go MMM. I liked the car box. I like the Van rack. Nice work. Looking forward to the solar gain window article! I’m saving up my empty beer cans so I can build one myself. Of course emptying said cans has been fun. Can’t wait to see your design! Good point, Rain – because of your point I just added a note about ratcheting straps to the article itself. I see many do-it-yourselfers in the Home Depot parking lot (and even some pro tradesperson friends occasionally) trying to secure loads with string and rope. It’s a waste of time – the straps do a much better job, and faster too. They are small and light enough that I leave them in the van at all times to be prepared. With anything that’s much longer than it’s wide, it’s also a good idea to use a strap around the front and down to the bumper, in order to keep the load from twisting. Not a waste of time if you’re a boatswain’s mate! Learn those skills, and you’re better off long-term because in a pinch you can work with any kind of line (rope) and secure (fasten down, tie down) any kind of load without special-purpose straps. If nothing else, learn the bowline and the trucker’s hitch. Yeah, tying stuff down is important. I was driving from Cambridge, MA to Quebec, and my friend was transporting some insulation panels on the roof of his car. Since they have a lot of surface area, they do like to fly. It turns out that you can put a washing machine inside a Subaru Outback. Then you can transport it using straps. Worked pretty well. Some of these “smaller” vehicles have more usable room in them than larger vehicles with humps nad bumps and think interior panels causing obstructions. We can carry a stove in our 1st gen CR-V with the hatch and glass closed. Pretty sure that laundry appliances are similar size and would fit too. See lots of folks driving large vehicles all the time just in case they need to haul something large but that isn’t heavy. Full size SUV to carry a few hundred pounds of widgets??? Instead use a small utility trailer behind a smallish car or instead of the big pickup truck – look for a smaller Tacoma or Datsun pickup. Don’t need a modern huge F150 to carry a 100 lb washing machine. Nice job on the creative design!! You come up with the best ideas. The roof rack is definitely good for long and somewhat light items. When the object is both heavy and long. Another option I have used is if you have a trailer hitch and the required wiring, you can either rent a trailer for the day or borrow one from your neighbors or friends. I had to use the trailer to bring home a couch I bought off Craigslist in April; that same day after the couch was unloaded, I went over to lowes to pick up some plywood sheets, thus batching a couple tasks together in one day. That’s a great idea :) also, I love love love rachet straps. I don’t have any at the moment – just have the kind of webbing straps you pull through a metal buckle, but I think I will get some rachets for my car when I start carrying the kayak further than the local river stop. No roof rails on our Scion xA, unfortunately. Any tips for the rail-less? On the Xa, I have run straps through the open door openings and over the roof, then closed the doors on the straps. Three cheers for Practical-Idea-Planting MMM!
. . . But also for Threatening-A-Face-Punch MMM, who is also quite effective. You broke through my 12mpg V8 shell with Ditching The Gas Guzzler. Dakota up for sale on CL, eyes peeled for a Fit or Mazda3 after I make the sale. DW onboard but amused by latest round of self-reinvention. So much comes down to simply being mindful and intentional with our lives and not allowing ourselves to exist as drones. Great idea. I’m not sure what my roof rail situation is. I don’t think my Mazda5 has one. I generally don’t carry big bulky stuff much, but it would be nice to do it when I need to. If you’re only doing one or two trips, I’ve found that keeping an eye on rental specials you can sometimes get a pickup for an entire weekend for under $30. For some reason car/truck rentals are way cheaper now than they were 20 years ago. This is ideal if you don’t need to haul stuff often. When I do this (about once every two years), it’s usually when I bought something large. But I’ll also get any heavy trips (trips to the recycling centre or dump) done in the same weekend. using the roof is for sure a great way to utilize transportation “room”. I do have one problem with this. Most people don’t properly tie down their crap. Just look left and right on the highway. Not tied down properly also means a very serious threat to pedestrians that might cross unexpectedly in front of you and get seriously hurt when one of those 16 foot mdf mouldings takes a fly and stabs them in the gut. I also want to warn people form overloading a roof. My 2003 Hyundai Santa Fe has a roof loading rating of 75kg TOTAL loading capacity. So putting 500 feet of mdf base board moulding will exceed this greatly. Considering the rust and rot in the vehicle, I would be seriously concerned of carrying this over my head. I prefer a trailer for this kind of stuff. Regardless, this article get’s people thinking outside the box. Can’t wait to read about the solar window. I have to say that many of the recent articles started to turn me off this blog (spraying oneself down with water instead of using the AC when driving is just weird in my opinion) but I am glad to see you get back to more practical stuff now. But then again, many people think I’m nuts for changing my own brake pads on my truck when making a combined income of a quarter million annually. So it’s all a point of view I guess. Cool idea, though I know it won’t work on my rail-free compact car. Very rately do I purchase anything that is that large to make it worth my while. For example, when I had to buy a freezer, I just borrowed a friend’s Suburban – a legit purchase in their case since they have seven kids. (I did reimburse them for the gas I used when I drove it – that did make me cringe.) I also timed my big craigslist purchases for visits from my parents since they typically drove a minivan or small SUV. – Payload: the Ram with its overweight body and coil sprung suspension has a payload of 1300lbs. If passengers are aboard then they subtract from the payload. My trailer’s payload: 2000lbs. And it’s (almost) independent of the vehicle’s payload. – Doing more with less: Average used 4cyl, 90-140hp. Ram, 390hp. – Cost of insurance, maintenance, gas on the Ram: stupid. Utility trailer: negligible. – Other benefits: The truck bed comes with you even when it’s not in use. My unused utility trailer makes a great portable shed. Can I ask what kind of 4 cyl vehicle you have? I’ve thought about this, but several of the 4 cyl I’ve looked at frown on trailer hitches and towing after a certain model year … Like the scion xa. I’ve towed on every 4cyl econo-box I’ve owned. A ’86 Corolla, a ’91 Sentra, a ’99 Jetta and currently a 07 Forester. The Forester is the only one to have a listed tow rating, at 2200lbs. And while towing was “not recommended” on the others, they proved capable of towing a 1000lbs, maybe 1500 over a short trip. I suspect the reason manufactures don’t list tow ratings is for liability: they don’t want the increased wear on a warranteed vehicle; towing consumes the vehicles designed safety margins and; it makes the car less idiot-proof. The fact is a modern car is designed with a lot of safety margin on its braking, suspension and cooling systems, (I don’t mention power because every 4cyl made in the last 20 years has plenty). As long as you’re sensible about how you load the vehicle and how you drive it, then it’s very capable of doing the job of a half-ton truck. Often it’s useful to go to foreign sites for cars and check tow ratings. For instance, the 2012 Civic w/ a 1.4L engine is rated for 500 kilos towing in the UK w/ no trailer brakes, or 1200 kilos with trailer brakes. 1000 kilos is 2500 lbs! Tongue weight is limited to 165 lbs. But here in the US, people will absolutely freak and tell you you’ll ruin your Civic if you try and tow a trailer w/ a 400 lb load on it. The distributed weight roof subframe is a useful suggestion, MMM. Also, small trailers and hitches for cars are underrated and underappreciated. Many vehicles are rated to tow up to 1500 pounds. Confirmation of the maximum load limits is generally found in a vehicle’s Repair Manual, available from the manufacturer or eBay (note: not the “Owner’s Manual”). Finally, I would recommend checking with the relevant authorities (not Home Depot) prior to loading *your* vehicle with long materials and transporting them at highway speeds. While you might think they are secured correctly, they very much might not be. And several states have prohibitions on the amount of protrusion of top-secured materials beyond the perimeter of the roof line (and height). While a minivan (or truck bed, the minimum perimeter exception in many states) will provide a larger breaching allowance, in some cases you might find yourself with reds and blues behind you, regardless of how many flags you attach for “safety”. And, at least in MA and VA (and I believe SC), if you are pulled over, you’ll be disallowed from continuing after a citation while the items remain affixed. My province (Alberta) has some of the same restrictions as you mentioned. We use to carry 20 ft pieces of aluminum tray for work, and the overhang ended up being about 3 ft from the tail gate. Major fines in a commercial vehicle, not likely going to get harassed by a PO if its personal vehicle. I’ve hauled a lot of stuff in and on the hatchbacks and station wagons I’ve owned. Small cars usually don’t have rails or anything to attach a makeshift rack. And the roof tends to be very curved. My solution has been to use an old folded up comforter (from the thrift store) as the base. It’s kinda hard to explain, but start with a queen comforter and make 6 to 9-inch-wide flat rolls on each of the 4 sides. Each edge will then have 3-7 layers of comforter. These will sit along the edges (sides and front and back) of the roof where it is strongest, and raise up to a level that clears the dome in the center (still covered with one layer of comforter). Then you can carry furniture on the comforter either directly if it’s structural (I’ve done an entertainment center) or create a wooden rack just like the one in MMM’s photos (which could also be used for any cargo, from long items to luggage, etc.). Of course, you need to anchor it with straps through both front and back windows and wrapped around the furniture (make tight loops) or around the wooden rack–or both. I like the idea of using ropes and knots, but to fit through the window or door opening, you need the flat straps–I have the ones with spring-loaded metal clips to hold the strap tight. The title combined with the pictured cars made me laugh a little. The car pictured are in my view All big cars. And i think a lot of people in my country (the neteherlands) Will agree with mee. Currently we moved close to my husbands job, so we just need one car. Though we stil owne a ford mondeo break And a citroen C1 witch is half the sise of de mondeo. The C1 is to small to transport carpentry material safely with a roofrack but it can transport 4 persons comfortably. Currently i ‘ m considering seling the ford mondeo. And to rent a van for big transports. Even if we have tot rent a Van one day every month it wil be cheaper to chose the realy smal c1 over the ford mondeo. So no roof racks for me. My dad is constantly making DIY roof racks. They work for the most part, if you’re meticulous. He’s never lost a load or anything off of his vehicle. Sometimes, it shifts though (if it’s something like lumber). Thanks for this – I read it a while ago and have taken some time to find it again. Your site is now book-marked. I have horizontal bars that I can bolt on to my roof, but they are pretty useless without some sort of bed to attach things to – although I guess horizontal bars are better then the stock bars you have for moving long wood. I need to move general stuff, so inspired by your post I am going to make a wooden base for my bars with some scrap wood. Thanks again. My homemade roof rack is made from 4″ diameter thick walled aluminium tube that I got from my local recycling center (read dump). I only use that when I know that I need to carry a lot of stuff. For emergency scavaging and small loads I carry two pieces of 2″ thick rigid insulation about 3′-6” long by about 6″ wide. I place one at each end of the car top (Dodge Intrepid), place plywood or pallets, etc. on top of them and use ratchet tie downs through the door ways. I have to slump a little while driving to be under the straps and if it is raining the straps leak. I’ve been doing this for several years with no problems. I don’t drive fast or far. I did a similar trick with an old VW Beetle, moving ALL of my belongings back from college (boxspring, mattress, table, chair, box fan, and bicycle all went on top). Two vertical 2x4s up from the back bumper supports to just above top roof height, U-bolted to the upper bumper supports (this was a ’65 plumber’s nightmare VW). Cross-piece 2×4, and “x” cable-and-tensioners to provide L-R stability. Eight-foot 2x4s to just above top of windshield, and crosspiece L-R above windshield. Ropes from front crosspiece under car just in front of front doors, to front bumper and to back bumper. Indoor-outdoor rug wrapped around boards where they came into contact with roof; 1/4″ lag bolts with washers where I connected wood to wood. Worked like a charm. Looked like the Clampetts, though. MMM please forgive my bad eyes and/or poor use of intelligence, but — is that wooden frame actually attached to the car or to the roof rails? Or, does it just sit in between the roof rails and allow the roof of the vehicle itself to support more material more stably? I could not tell for sure from any of the pix. You got it – it just fits nicely between the rails, which makes it easily to strap down securely. No need to attach anything to your roof, unless you’re an actual tradesperson using the vehicle for work.. then you’ll want to make a good metal rack with all the handy features. Not worried about denting the roof or scratching the paint? Been there done that. Car slowly becomes an eyesore and rust sets in from missing roof paint. Bought a roof rack for my convertible VW Cabrio (!) and have hauled bikes and small quantities of lumber on that roof rack. Purchased on eBay new and cheap. Bought the CR-V factory roofrack separately from the car purchase years ago. Dealer prices are insane but found it online a few months otherwise for much less. Have carried everything on the roof. Very secure and keeps everything off of the paint which is still good. I vote for the small trailer. Mine is a bit under 4×8 (Brenderup 1205S) but plywood lays on the trailer very well, then I can pile sticks of lumber on top of that and then tie it all down with ratchet straps. can carry 1000 lbs that way if I want. Seldom more than 500 lbs though. Rides very good and quiet. Don’t hardly ever need to buy more than 8ft lengths but have hauled a few sticks of long lumber on the roof rack. This may be the most brilliant use of a minivan ever. I love working with wood but it has always been difficult picking up sheet goods. Veneer gets scraped up quickly if you’re not careful and panel saws do terrible things to furniture grade ply. I usually rent a pickup at Menards or borrow a pickup. This will save time and money. Thanks for the tip. Been a Mustachian for quite some time. Trimmed down to 1 car from 2 cars and started using bikes more often. Now a problem. We have three bikes (Me, son and wife) and need to take all three bikes along in our car for any recreational biking. I have had bad experiences with racks that you hook against your trunk. Once the racks slipped dragging the bikes and other time damaging the truck metal. Was thinking roof / hitch racks would be much more reliable. However, my Yaris hatch accepts only class 1 hatch. Class 1 does not seem to have much options for bike racks that can hold 3 bikes. The standard for platform racks seems to be 2 inch receiver that needs minimum class 2 hitches installed. I’d just use an adapter (1 1/4″ to 2″ box steel), make or buy. Class 1 should be rated 200 lbs, plenty for 3 bikes. I’ve driven a Kia Rio Cinco (Canadian version 5-door) the last 5 years. Inside I can fit 9′ 2×4’s, 10′ conduit, 80+ 1×6 6′ fence boards, a collapsable 14′ step ladder/27′ extension ladder, and so forth. All tools and tool chests load easier and are kept safer than with truck box. Anything bigger goes on the roof. Cut 48″ cross pieces out of (chain-link fence) top rail, or 2×4’s in a pinch. I prefer these to a fixed wooden frame, because it is lighter, and easily fits in the back without taking much space. I’ve renovated a few houses and built a bunch of fences, etc with just this car. 16′ boards, 12′ 6×6 posts, whatever, all goes on top. “With the advent of trailers, Boom – the entire category of vehicles known as pickup trucks is now obsolete”. Trailers are easier to load and unload, they can be dropped and left full of supplies or empty (to load). Cars are simply better to drive and have better interior, lockable space than trucks. Also truck drivers have a high jackass-coefficient. … watch the bumps, those roof rails are only riveted on! MMM, I’m a huge fan, you are the living, respectable, proof of everything I believe in! Thanks for spreading wisdom and reason.